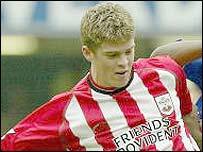 Southampton defender Danny Higginbotham has predicted teenager Martin Cranie will bounce back from the worst possible start to Premiership life. England Under-18 captain Cranie scored an own goal in Saints' 4-0 defeat by Chelsea at Stamford Bridge. But Higginbotham told club's website: "There was nothing he could do about the own goal. "He's a very good player with a bright future who certainly didn't look out of place at all." Higginbotham added: "It wasn't easy for him going into the side against such a top team as Chelsea but he acquitted himself well. "It was a tough place to make his debut and it was heart-breaking for that to happen to him. "I really felt for him over the own goal. The ball came at him very suddenly and he could not get out of the way. These things happen in football. "He might have got the last touch but it was not his fault. He went to challenge and the ball came off his head."